Staying active and enjoying nature - the region around Olsberg is ideal for this. The Sauerland region offers ideal conditions for cycling, hiking and other active recreation, both in summer and winter. The region is among the most popular holiday destinations in Germany and keeps people coming back thanks to its tradition, its hospitality and its wide range of sport and leisure options. 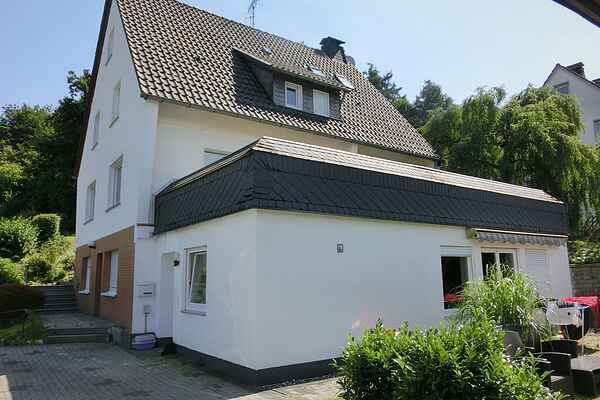 This comfortable and fully equipped holiday apartment with a separate entrance is located in the district of Bruchhausen. The apartment offers a unique view of the well-known Bruchhauser Steine, which are practically at your doorstep. Enjoy the view of these historic rock formations in the morning and the sunset from your own private terrace in the evening. You will also have the garden, including its garden furniture and grill, entirely to yourself. The surrounding area, popular for hiking and leisure, offers a wide range of trails with a lot to experience (such as the Olsberger Kneippweg and the Rothaarsteig). The towns of Willingen, Winterberg, Brilon, Medebach, Meschede and Schmallenberg are easy to reach from here. The part of Sauerland around Bruchhausen offers a countless selection of interesting and worthwhile daytrip destinations: summer toboggan run (1.5 km), steamship tours (18 km), Fort Fun amusement park (20 km), mining museum (15 km), go-kart track (7 km), ice sport centre (10 km) and much more.